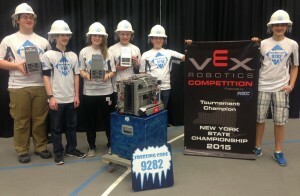 Oswego robotics team won the Northern NY VEX Skyrise State Championship for the second year in a row and now qualifies for the world championship competition. Pictured from left: Freezing Code Robotics team members Michael Beckwith, Jordan Runner, Lydia Tryon, Adam Humphrey, Jeremy Braiman and Jordan Tryon. Not present: Matthew Bates. Freezing Code (#9282) is a team of seven local youth (from grades 9-11), which is in its second year of building and programming robots. The team will now have the opportunity to compete against VEX robotics teams from all around the world. The state championship, held in the SRC Arena at the Onondaga Community College on February 7, was the final New York State event of the 2014/2015 season. This STEM (Science, Technology, Engineering and Mathematics) event provided spectators with non-stop, action-packed contests between robots created from the VEX Robotics Design System. Participants squared off in the game “Skyrise,” developed by VEX Robotics, Inc. and the Robotics Education & Competition Foundation. At the event, teams and their robots formed alliances and worked together during the two-minute contest to build tall skyrise towers using short segments. Robots also stacked cubes on their skyrise and on posts along the perimeter of the field. Freezing Code had an amazing record of one tie and seven wins during the qualification rounds. They continued this winning streak, with their alliance partners, throughout the quarterfinal, semifinal, and final matches to win the tournament. The consistent scoring of the Freezing Code robot in the 15-second autonomous mode made it impossible for the other robotic teams to have an advantage. The allies, #8746 from Rome Free Academy and #8828 from Saratoga Springs City School District, went undefeated in the six matches played. Their outstanding performance earned each team in the alliance first place in the state championship and an invitation to the world championship. Freezing Code also walked away with the only design award for the day and the highest autonomous skills score in which the robot is programmed, not driven, to score as many elements as it can in one minute. Forty of the best high school robotics teams from all over New York State competed, by invitation only, for the title of state champion at the Northern NY VEX Robotics State Championship. The Freezing Code team attended seven regional tournaments this season, winning the design award at five of them and being named tournament champs at three of them. This outstanding record gave them an invitation to the state championship. The competition season culminates April 15-18 when the top performing teams from VEX Robotics Competitions around the world will compete against each other at the VEX Robotics World Championship at the Kentucky Exposition Center in Louisville. At the world championship, these exemplary teams will have the opportunity to challenge their top-ranked peers from the United States and other countries such as Brazil, Canada, China, Colombia, India, Japan, Malaysia, Mexico, New Zealand, Puerto Rico, Saudi Arabia, Singapore, Spain and the United Kingdom. The Freezing Code Robotics team will now begin raising funds to attend the world championship. They have eight weeks to raise about $9,000 to cover travel expenses for the team. Freezing code is also seeking sponsors for the 2015-16 VEX season. More information about Vex robotics may be found and the team can be seen in action at www.facebook.com/freezingcodeteam9282 and www.youtube.com/user/FreezingCode9282.